When Congress passed the National Trails System Act in 1968, the system included two existing trails and fourteen proposed trails. 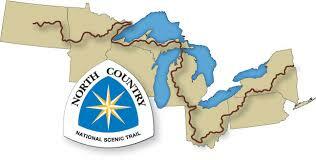 One of those proposals, the North Country National Scenic Trail (NCNST), was approved by Congress in 1980. When completed, the NCNST is expected to reach 4,600 miles, from Crown Point, New York, on the southwest shore of Lake Champlain, to Lake Sakakawea State Park in North Dakota. At the time of this writing, about 1,800 miles of the total trail route have been completed, including more than twothirds of the 195-mile route that has been proposed through Pennsylvania. The NCNST snakes its way through the northwestern corner of Pennsylvania, entering from New York into Allegheny National Forest in the north and exiting near Negley, Ohio, in the southwest. Completed sections include 96 miles in Allegheny National Forest; a portion of the preexisting Baker Trail to Cook Forest State Park; a section through state game lands in Clarion, Butler, Lawrence, and Beaver Counties; and sections within Moraine and McConnells Mill State Parks. The remainder of the proposed NCNST route includes various sections from the southern boundary of Cook Forest State Park to the Ohio state line. The completed 96-mile segment in Allegheny National Forest, signed and marked with blue blazes, is the longest trail in the national forest. The trail enters from the New York state line north of Willow Bay Recreation Area, on the eastern shore of Allegheny Reservoir. The NCNST travels south through old-growth forests in the Tionesta Natural and Scenic Areas, and then westward through Cherry Run and Henrys Mills. The trail briefly joins the northern end of the Minister Creek Trail, continues westward to Dunham Siding near Heart’s Content Scenic Area, and then heads south again through Kellettville. The NCNST joins the Baker Trail at the national forest boundary south of Muzette. For the backpacker, seven national forest campgrounds are located on or near the trail. Primitive camping is permitted nearly anywhere within the national forest, except at a few designated areas. For more information about the NCNST, or to help with its implementation in Pennsylvania, contact one of the state chapters of the North Country Trail Association (NCTA), described on their website. The North Country Trail website also has maps to view or purchase, including descriptive guides for the completed section in Allegheny National Forest.